After their stunning 5-3 victory over third placed Horsham YMCA three days previously, this was a case of after the Lord Mayor’s show for Hassocks as they went down to a 2-1 defeat to AFC Uckfield Town. 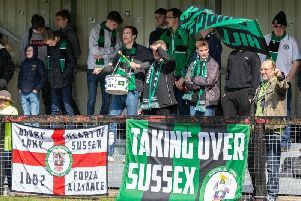 The Oakmen have carved out a reputation as cup specialists this season, having been the Southern Combination League’s last representatives in the FA Vase when embarking on a club-record best run to the fourth round. And Anthony Storey’s side still harbour hopes of lifting a first piece of senior silverware with a Sussex Principal RUR Charity Cup quarter final and a Peter Bentley League Cup semi-final to come. That knockout form suggests that on their day, they can be one of the better sides in the Premier Division and they certainly had their day at the Beacon, an impressive performance bringing to an end the Robins’ four game winning run. Mark Dalgleish made one change to the side who had blown YM away so impressively at the weekend, Spencer Slaughter returning in place of Harvey Enticknap with the young midfielder dropping down to the bench. were going to be in for quite a busy evening at the heart of the Hassocks defence. Hassocks by contrast were lacklustre throughout, no doubt feeling the effects of their exertions against YM as they failed to really test Louis Rogers in the Uckfield goal. The first real chance of the game arrived in the 15th minute, Cormack showing that he is as good in the air as he is with his feet when rising to meet a Regan Smith corner but his header was kept out by Josh Green’s crossbar. Callum Smith’s pace then allowed him to spring the Hassocks offside trap but he dragged his low shot just wide and a rare Hassocks foray forward was snuffed out when James Littlejohn’s cross was cleared by a Steve Hickman-Smith header with Richie Welch clearing up before Phil Johnson could pounce on the loose ball. Littlejohn and Johnson both saw efforts well blocked while Rogers was quick off his line to thwart Johnson as the Hassocks captain attempted to latch onto a through ball. There were less than 60 seconds of regulation time in the first half remaining when Uckfield took the lead, Bailo Camara embarking on a winding run down the left flank to cross for Dee Okojie who arrived from the right flank to tap home at the far post. Uckfield began the second period as brightly as they had the first, Smith firing narrowly over as the Robins struggled to respond to the blow of going behind so close to the interval. Matters got even worse for the hosts just before the hour mark when Uckfield doubled their lead, defender Taylor Maddock producing a flicked header from a freekick for 2-0. Welch then sent an effort fizzing over as the Oakmen looked to kill off the game but their desire to get the third left Hassocks with spaces to exploit on the counter and Matt Barbosa had to be alert to put in a couple of strong challenges to prevent Johnson and Liam Benson from taking advantage. Hassocks did manage to pull one back but it was a case of too little, too late as Johnson emphatically beat Rogers from the spot with a 94thminute penalty. Hassocks: Green; Tighe, Jacques, Broomfield, Blake; Slaughter, Mills, Bull; Benson, Johnson, Littlejohn. Subs: Enticknap (Slaughter), Lindsey (Bull), Stokes (Mills), Badger, Whittingham (unused).